Salman Khan, Iulia Vantur, Sonakshi Sinha Surprise Preity Zinta On Her 43rd Birthday! 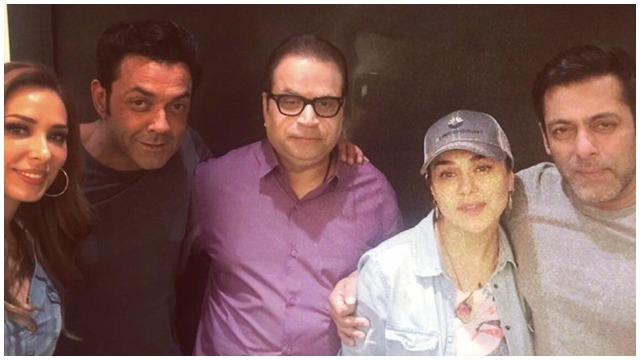 Preity Zinta has been away from films for a while now, ringed in her 43rd birthday with the most special friends. The dimpled actress had Bollywood celebrities Salman Khan, Sonakshi Sinha, Bobby Deol and producer Ramesh Taurani among others to surprise last night at her residence in Mumbai. Salman’s rumoured girlfriend Iulia Vantur was also present at the surprise bash. Is Preity Zinta Expecting Her First Child With Husband Gene Goodenough? Thank you all for all the wonderful birthday wishes ? So humbled and so touched by all the good wishes ? Loads of love ! Muaah ?#aboutlastnight #unplannedgettogether #friendsforever ! This picture takes you down the memory lane as it brought Soldier actors Bobby Deol and Preity Zinta in one frame. Preity Zinta, who is married to her long-time American partner Gene Goodenough is currently gearing up for the new season of IPL cricket. Previous : Raghu Ram And Sugandha Garg Making Divorce Official With This Post Is Breaking The Internet!